Five dedicated members of Deer Park High School’s Red Cross Club assisted the Suffolk County Meals on Wheels program in Amityville on March 14. 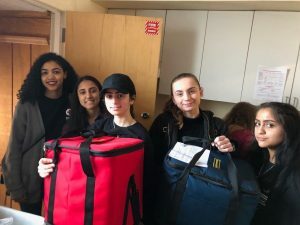 Red Cross Club President Yasmeen Sayedda-Hensley and fellow students Dana Ali, Diana Damian, Jasleen Kaur and Gabriella Sroka packaged meals in insulated bags and handed them to drivers for delivery to needy individuals throughout the Town of Babylon. The majority of recipients were elderly persons who could not cook or provide for themselves. IMG_0281: Deer Park High School’s Red Cross Club members Dana Ali, Diana Damian, Jasleen Kaur, Yasmeen Sayedda-Hensley and Gabriella Sroka assisted the Suffolk County Meals on Wheels program in Amityville on March 14.